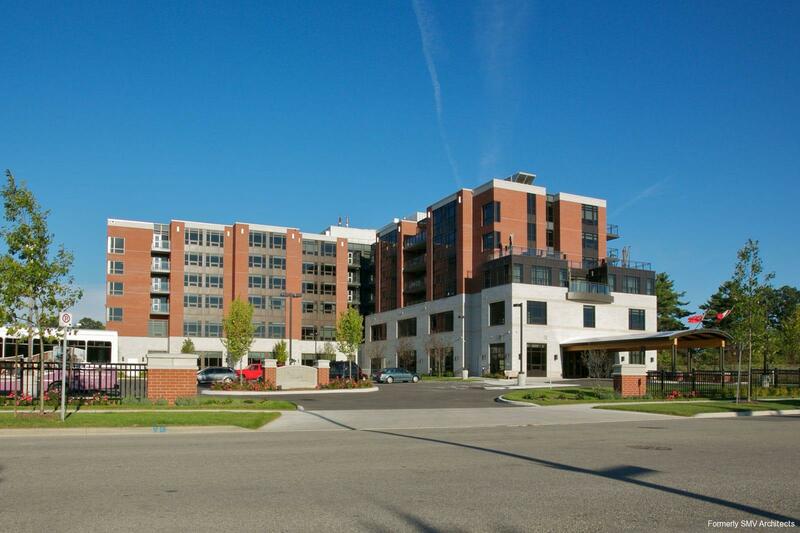 Originally known as The Dunfield Cambridge, this modern, luxury retirement residence was purchased and re-branded by Revera mid-2016. Nestled by the mature hardwood forest of the Shades Mills Conservation Area in Cambridge, the L-shaped 6-storey building is set amid extensive landscaping. Offering a full continuum of care with a home-like living experience and the comfort to “age-in-place,” the complex has 133 residential units comprising independent, assisted, and memory care living. Designed for the comfort of residents and the peace of mind of their families, Granite Landing resembles a charming hotel or resort in a leafy and scenic suburb. With its architectural stone and red-brown brick, reminiscent of the farmhouses and other buildings from the area’s agricultural and milling history, the building accommodates a complex program in a simple mid-rise design well-separated from the street. Above the porte-cochere, which culminates in a walkway at the sidewalk, the building rises to three storeys before setting back, reading as a two-storey base with a four-storey upper, respectful of the surrounding residential properties. 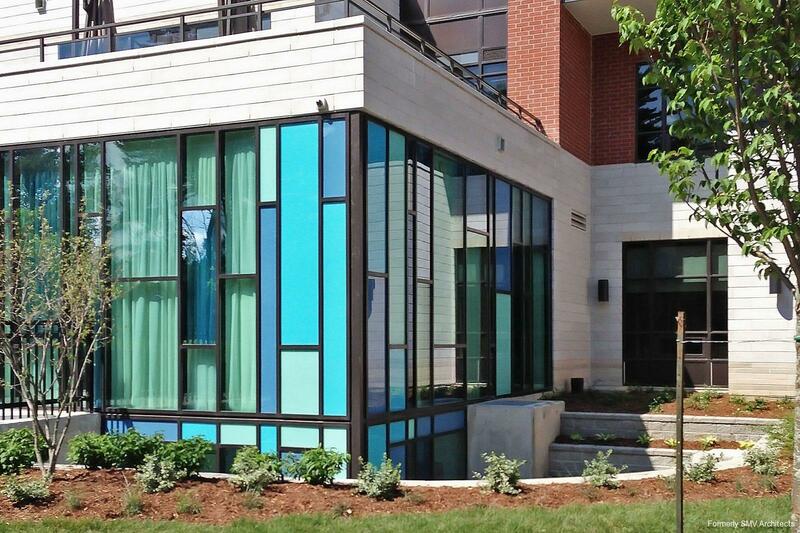 Three colours of glass were used in various patterns for both exterior and interior interest, especially in the main floor dining room and bistro, both of which feature patios. 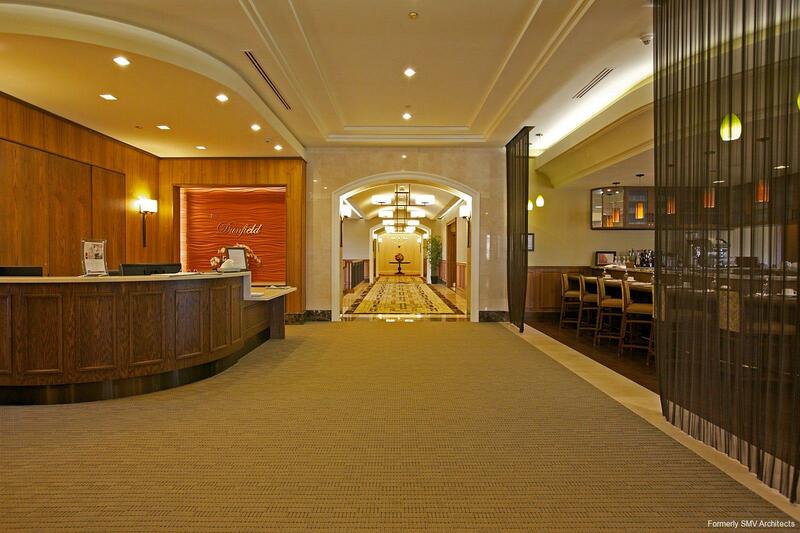 The hotel-like ambience begins at the porte-cochere, follows through into the lobby and grand foyer, onto which the bistro opens. The extensive amenities are spread over three floors, encouraging residents to move about the building. 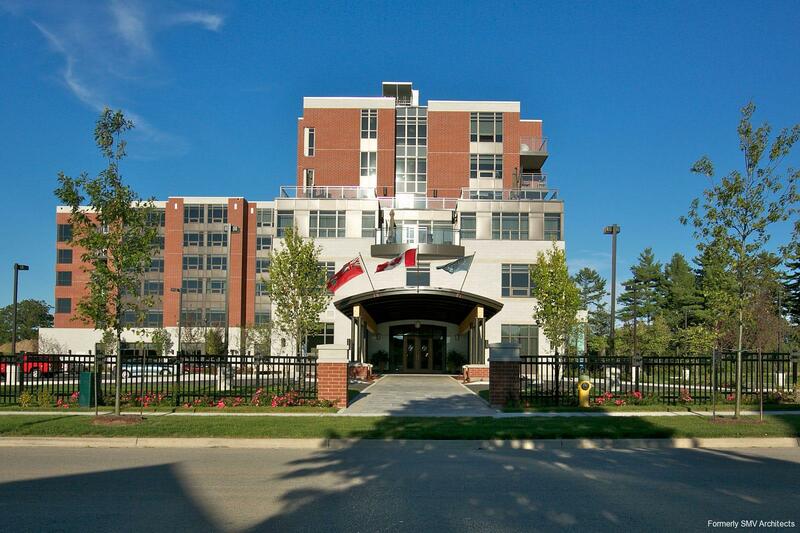 The four independent living floors include studios as well as one-bedroom and two-bedroom suites with large balconies. 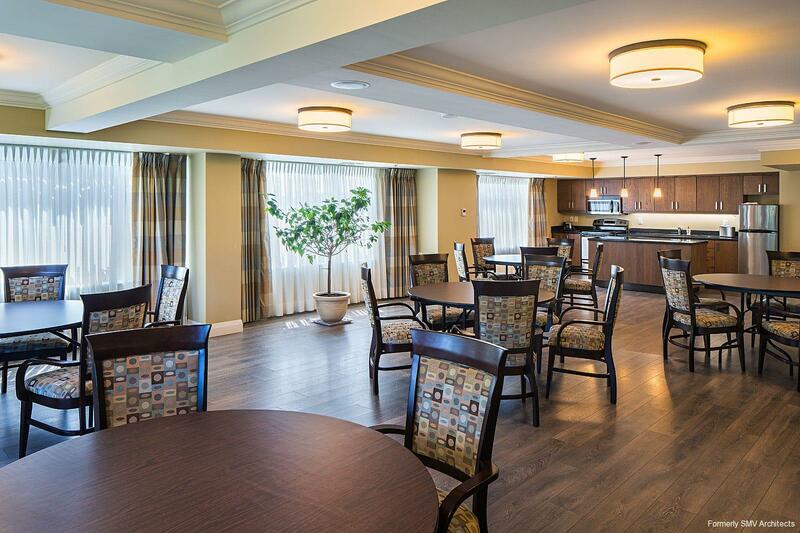 The second floor Assisted Living area comprises studio and one-bedroom suites, a dedicated dining room, lounges, and a nursing station. The studios in the Memory wing share a nursing station, a private lounge, dining area, and secure outdoor garden. Shared amenity spaces include a spa with pool, fitness room, billiards room, theatre, large multi-purpose room, dining room, and bistro. 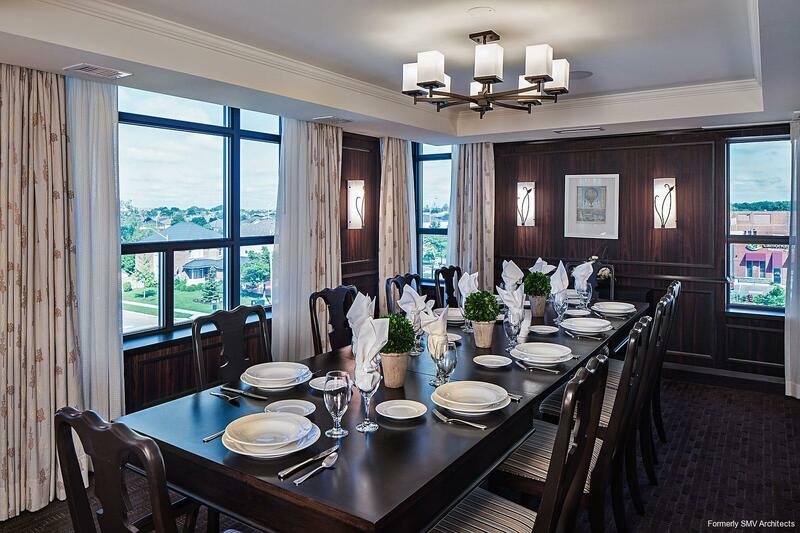 Just above the porte-cochere a third floor private dining room is available for family gatherings. 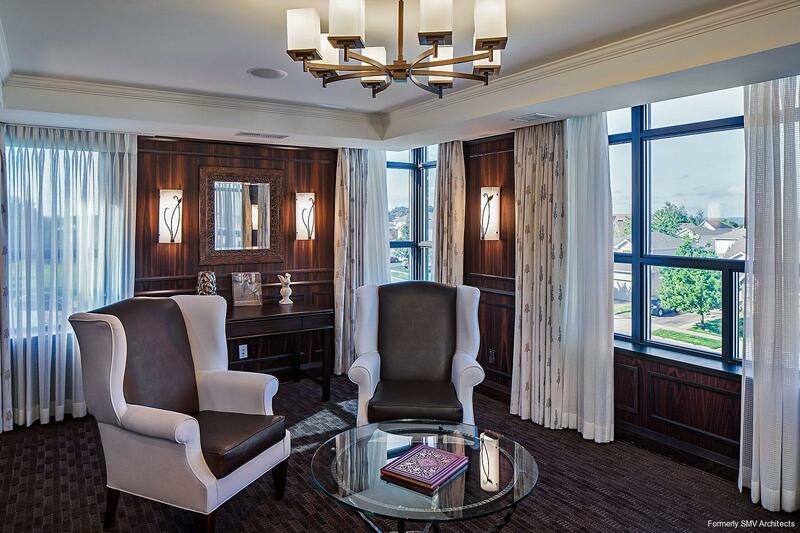 The comfortable library and private dining room are on either side of an outdoor terrace.